Mr. Schumann received a Juris Doctor from Louisiana State University, Paul M. Hebert Law Center in 1988. Originally from New Orleans, Louisiana, Ray relocated to Southwest Florida in 1991. In 2011 he and his family moved to Central Florida. 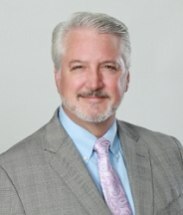 His status as a Florida Bar Board Certified Real Estate Attorney places him in a category achieved by less than ½ of 1% of all currently licensed Florida Attorneys. He is also a member of Orange County Bar Association, Louisiana State Bar Association, and Volusia County Bar Association. Ray concentrates his practice on commercial and complex real estate and business transactions. With his comprehensive and extensive real estate and business expertise, he focuses primarily on matters involving real estate and business transactions, acquisition, development, strategies and planning. Ray has significant experience in commercial real estate financing, mortgages, loan restructuring and workouts by representing numerous lending institutions and private entities; he utilizes his facilitation mind-set in negotiating, closing and enforcing commercial contracts, leases and property management agreements for brokers and investor/owners, and providing title issuance, rectification and defect resolution advice, guidance and services for all those involved in the transactions. Ray is well known for his unique solution-minded approach while keeping the “end goal” in mind to achieve the desired results. Daytona Beach Area Association of Realtors, Inc.
Cape Coral Housing Development Corp.
Bonita Springs-Estero Association of Realtor®, Inc.